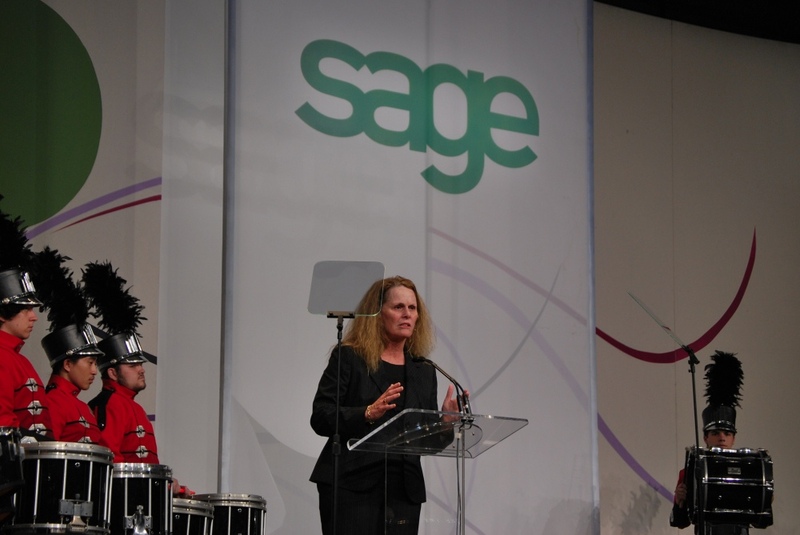 Sage have just announced that North American CEO Sue Swenson will leave the company (retire) in 2011 (exact date unspecified) to be replaced by Sage France’s Pascal Houillon. If I were to bet I’d say that Sue’s last day will be on or about June 18, 2011. 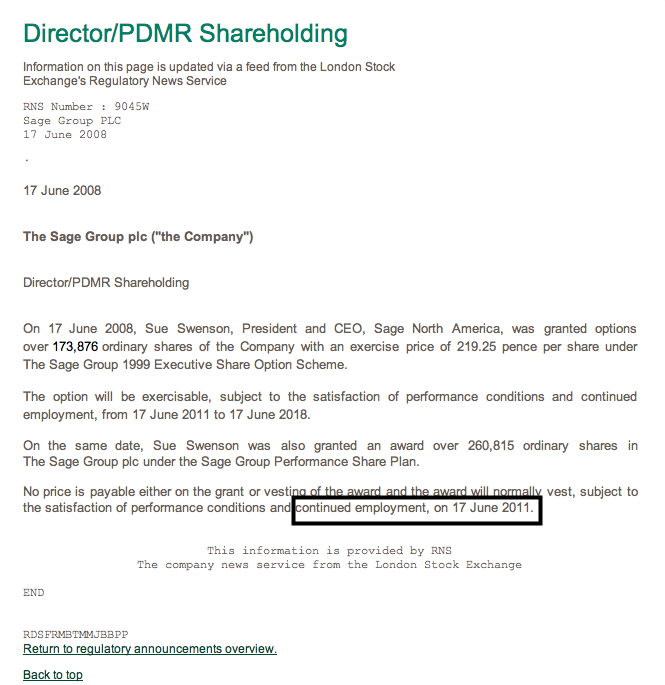 This just so happens to conveniently coincide with the day when Sue Swenson’s 260,815 stock options vest with Sage UK according to this company announcement of June 17, 2008. Sue Swenson joined Sage in 2008 after a surprise 2007 management restructuring that saw a number of Sage executives ousted. In her almost three years at Sage she appeared to be largely batting cleanup and did not take a central visible role in communicating to Sage’s channel or in meeting with the VAR community. Other Sage VARS described Swenson as a slightly reclusive CEO who appeared focussed on the job at hand rather than mingling with the Sage channel. As near as we could tell Swenson was brought in to create an organizational structure where the various business units could exist on their own if needed. Other than an annual appearance at the Sage Insights conference (now Summit) few consultants or VARS reported much interaction with Swenson. She was rarely spoken about by other Sage employees. Her lack of integration with Sage’s channel partners appeared unusual given that Sage repeatedly states their commitment to operating through the use of business partners. During Sage events, most notably at 2009 Presidents Circle, Swenson did not play any role and was barely mentioned from the podium save for when employees were questioned about her absence. Her departure announcement follows that of Jodi Uecker-Rust who left in October 2010 after spending about a year at Sage running their biggest North American division. Prior to Sage Jodi Uecker-Rust ran the Great Plains software company as a defacto #2 to company founder Doug Burgum and was also a key employee at Microsoft who architected much fo the Microsoft acquisition of Navision. While a replacement has been named for Sue there’s not yet any indication of who will replace Jodi Uecker-Rust. Update 12/3/2010: Seth Fineberg at WebCPA reports that Pascal Houillon will assume leadership of Sage Business Solutions in January 2011. As for the rest of Sage’s earnings related news – North America shrank 4% in total revenues (the most of any division) yet held the line at 15% EBITA. Nearly all of Sage hit the 15% mark. Total revenues in North America contracted 4%* to £549.9m (2009: £575.8m*). Organic revenues contracted 3%* (2009: 8%* contraction) with an organic contraction of 2%* in the second half of the year. Organic subscription revenues declined 2%* (2009: 2%* contraction), while organic software and software-related services revenues fell 9%* (2009: 23%* contraction). In the second half of the year, organic software and software-related services revenues contracted by 4%*, against a contraction of 13%* for the first half of the year. The business environment for SMEs in North America remains challenging, although we did see some improvement in confidence over the year. Within our North American business we have seen progress across a range of initiatives such as premium support and renewals, cross-sell of payments into our ERP base, the launch of several connected solutions, continued increase in our customer satisfaction and brand awareness scores, and the reinvigoration of our channel partners. Sage Business Solutions, our largest US division, declined organically by 3%* in the year, and by 1%* in the second half of the year. However, we did see good growth in the second half of the year in certain key products such as Simply, ACCPAC and Sage ERP X3. Our mid-market ERP products are well positioned in the market, with a number of compelling releases planned for 2011. Whilst the US entry-level market remains cautious, we have had success in building our position in the Accountants channel, and Peachtree Business Care premium support contracts now account for almost 50% of Peachtree subscription revenue. Our CRM and construction vertical businesses continued to experience relatively weaker demand for new software, whilst our not for profit business grew strongly. We have launched a number of connected services targeting these markets, for example e-marketing (linked to our CRM solutions) and e-philanthropy for non-profit organisations, and these are showing early positive signs. 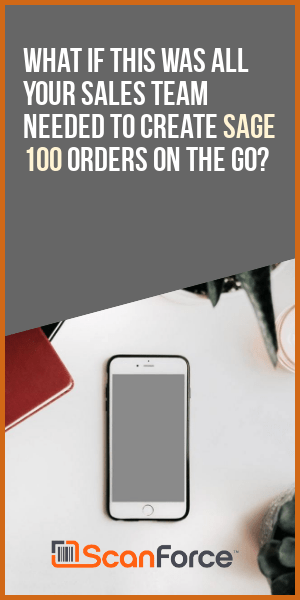 Sage Payment Solutions Division saw growth in the number of merchants and spend volumes, but a continued competitive pricing environment. Revenues were therefore flat* in the year. We have diversified our revenue mix by targeting mid-market businesses, which have a longer average customer life than small businesses. With a flexible platform for integration into other Sage products, cross-sell revenues into the Sage base increased by over 70%* to £7.8m, and this remains a substantial future opportunity. Sage Healthcare Division has continued to see growth in the Intergy product, and a contraction of the Medical Manager product giving an overall contraction of 5%* on an organic basis. We have made significant progress on our customer service, and we continue to see good customer wins for Intergy, although the impact of the American Recovery and Reinvestment Act (“ARRA”) funding is not expected to have an effect until April 2011 onward. To benefit from ARRA, users have to demonstrate meaningful use of Healthcare IT, so we were pleased that in October 2010 Intergy was certified for meeting the requirements for meaningful use. We have launched a new version of Medical Manager in the year which has been very well received by our customers. Our focus remains on serving our Medical Manager customers better, building our brand in the market and positioning Intergy to benefit from ARRA. Sage Healthcare Division’s EBITA† margin showed continued improvement to 20% (2009: 17%*). The EBITA† margin was 22% (2009: 18%*). The prior year margin excluding restructuring charges was 20%*.